This is a continued part of a series of blog entries about the techniques and tips from “The Inner Game of Music” by Barry Green and Timothy Gallwey. I have summarized the findings from this book – personal thoughts will be in brackets. The author’s website can be found at http://www.innergameofmusic.com . The skill of “awareness” is important as it allows us to pay attention to events, people, and things by using all our senses. When we are aware, we realize what feels and works best for us individually. It facilitates the ability to identify and solves problems instantly! -Ex. Take a moment to listen to the sounds around you (such as cars outside, the hum of electricity, people talking, etc.). Now focus on ONE sound for a moment. Did the other sounds fade into the background? -Ex. Listen to some music – does it express happiness, sadness, excitement? Relax and float into the feelings the music expresses. How do you feel? Notice your own feelings. -Ex. Our brain has stored all the experiences we have ever had with music. -Ex. Find out more about the piece you are playing – does knowing the background change the way you play? When we become aware of something, we may automatically try harder to fix it. However, the actual purpose of awareness is so that we can accept “what it” without fighting it. For example, “Jonathan” had jittery, sweaty hands before each recital. And he was afraid this would happen, which of course, they did. 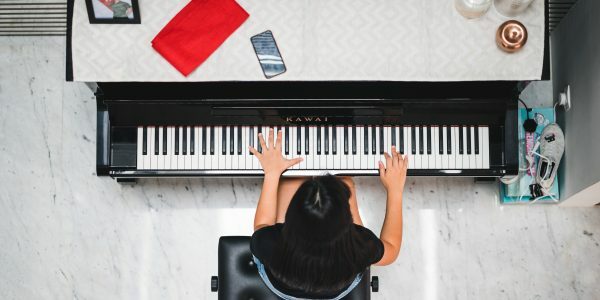 When the teacher showed him that his sweaty fingers didn’t really affect the quality of the music, he became less anxious and “allowed” them to sweat. The problem gradually disappeared. Another way to conquer the problem of feeling anxious is to see how much you can notice about your present condition. Locate the most severe part of the problem (sweaty hands, upset stomach, etc.). Does putting your attention on the problem change anything? Now see if you can still play the piece? Give your symptoms of nervousness/anxiety permission to be there, then choose another focus for your attention (sight, sound, feelings or what you know). Did you notice your physical problems tend to disappear as you become more involved in your playing? Awareness can also help solve problems in playing. Although Gallwey is the originator of the “inner game” idea, he is not a trained musician. But one day, he gave a master class for a couple of piano students who were having trouble with playing a duet. He simply asked them if they ever noticed exactly where they lost each other. The students came back 20 min. later and told him that as soon as they listened to the part where they became out of sync, they didn’t make any mistakes. Awareness had cured their problem. Next week: Using will power to achieve performance and experience goals. Next Post Protect your memory – learn an instrument!